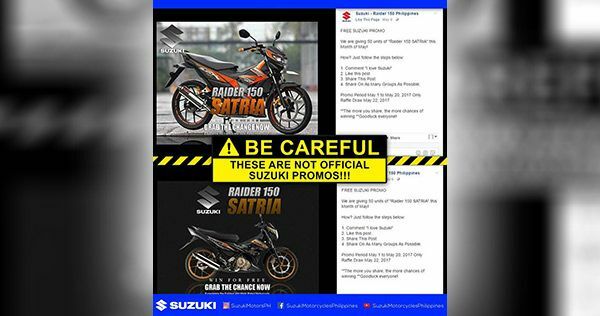 You may see similar promo posts as in these photos being shared online which require you to share, like and comment on for a chance to win 1 of 50 Suzuki Raider R150s (Satria in other countries). Please be noted that this promo is not facilitated by Suzuki Philippines, Inc. nor it is sponsored by us. Some commenters said the unofficial promo may have been created by certain individuals who were dismayed of the delayed release of the Suzuki Raider 150 Fuel Injected (Fi) model. In earlier replies to comments, Suzuki's page admin posted that there's no official release date yet.